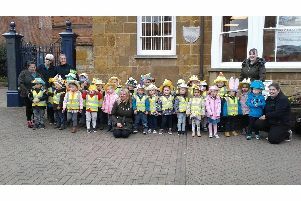 A property developer from Market Harborough is behind a major project to restore a former fire station and garage in a nearby town which he says will be a sympathetic restoration which will return the site to its former glory. Harborough man Kevin Jones is the man behind the construction work at The Yards, off Market Street in Kettering. He has already seen success with developments elsewhere in the area, in particular The Bakehouse restaurant in Rothwell, and he says he is now aiming for something similar in Kettering. When it opens in May, The Yards will be a large retail and food space, with its own wine bar/lounge and will be able to accommodate up to 50 independent niche retailers. Mr Jones said: “The site comprised two buildings, the former fire station, which was also an ambulance station, and a garage. Work began about 12 weeks ago and Mr Jones said the grand opening is planned for May. He and his daughter Michaela Jones, who is co-ordinating the retail side of the project, say they have already spoken to a number of retailers about moving into the site. Mr Jones said the restoration will re-use many materials salvaged from the site, and he aims to have an industrial/warehouse feel. He added: “The upper floor of the former garage had been largely left to pigeons for about 20 years, so there has been a huge amount of work in clearing it up. Michaela said the look and feel of the site has been inspired by similar places in Camden in London. She added: “We don’t want to just attract full-time traders. We may have people who want to hire space for just a couple of days a week, for example, who might be running a small business around other work. “They might even be a fashion student wanting to sell things they have made. “The former fire station will be an area we are calling The Exchange, which will be a bit like a department store in that there will be multiple traders with one central pay point. We will also be providing a kind-of business incubation service, so we will have people on hand who can help out with things like visual merchandising, if traders feel that isn’t their strongest point, and other services. Anyone interested in finding out more about retail opportunities at The Yards are being invited to take a first-hand look at the site. For more information, search for The Yards on Facebook or email michaela_sian@hotmail.com.